Columbia City attorney and banker, Gates (1893-1978) was elected State Commander of American Legion, 1931. In 1944, he led Republican Party to control of state offices and Indiana General Assembly. As Governor (1945-1949), he created state Department of Veterans’ Affairs to aid Hoosier men and women returning from WWII in obtaining employment, education, and housing. 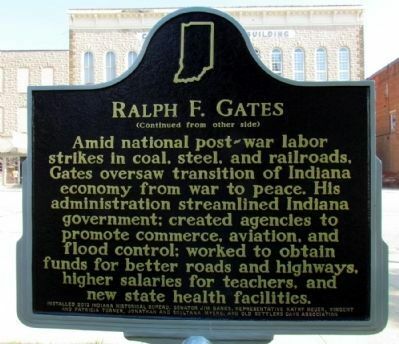 Amid national post-war labor strikes in coal, steel, and railroads, Gates oversaw transition of Indiana economy from war to peace. His administration streamlined Indiana government; created agencies to promote commerce, aviation, and flood control; worked to obtain funds for better roads and highways, higher salaries for teachers, and new state health facilities. 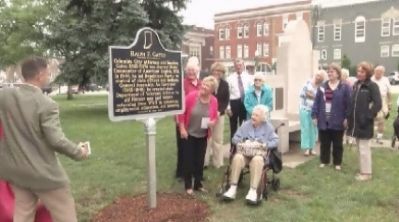 This marker is included in the Indiana State Historical Bureau Markers marker series. Location. 41° 9.412′ N, 85° 29.359′ W. Marker is in Columbia City, Indiana, in Whitley County. Marker is on Van Buren Street east of Chauncey Street, on the right when traveling east. Touch for map. 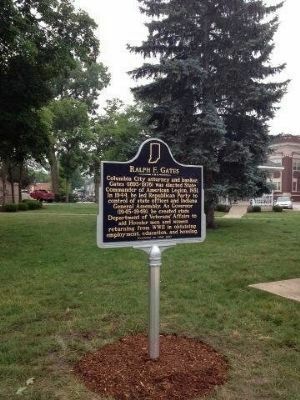 Marker located on the North lawn of the Whitley County Courthouse in Columbia City, Indiana. Marker is in this post office area: Columbia City IN 46725, United States of America. Touch for directions. Other nearby markers. At least 8 other markers are within walking distance of this marker. Thomas Riley Marshall (here, next to this marker); Valiant Men and Women of Whitley County (here, next to this marker); Whitley County Civil War Memorial (within shouting distance of this marker); Whitley County Korean War Memorial (within shouting distance of this marker); Whitley County (within shouting distance of this marker); Marshall, McNagny & Clugston (within shouting distance of this marker); Whitley County Jail (about 800 feet away, measured in a direct line); Home of Thomas R. Marshall (approx. 0.2 miles away). Touch for a list and map of all markers in Columbia City. 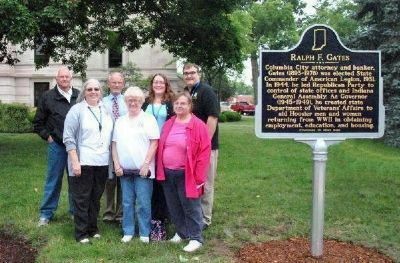 At the Ralph Gates Historical sign dedication. (L-R) Back: Board Member - Chuck Jones, Board Member - Russell Gilliom, Asst Dir - Angie Craig, Tech Cur. - Aaron Mathieu. Front: Director - Dani Tippmann, Board Member - Bev Henley, and Karon Ross. More. 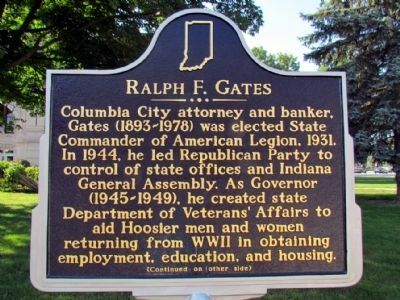 Search the internet for Ralph F. Gates. Credits. This page was last revised on June 16, 2016. This page originally submitted on August 19, 2013. This page has been viewed 416 times since then and 14 times this year. Photos: 1, 2. submitted on August 23, 2013, by Duane Hall of Abilene, Texas. 3. submitted on August 29, 2013, by Al Wolf of Veedersburg, Indiana. 4, 5. submitted on August 19, 2013.